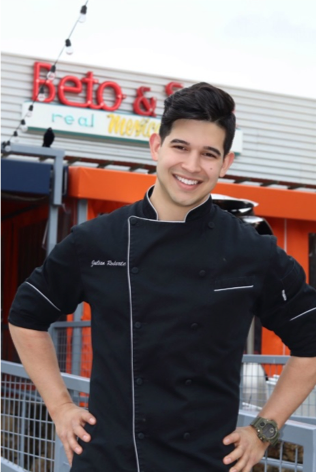 DALLAS – Oct. 19, 2018 – VisitDallas is pleased to announce a new partnership with local Chef Julian Rodarte of Beto & Son, who recently had a showdown with celebrity chef Bobby Flay on his Food Network program "Beat Bobby Flay." Rodarte will serve as the Official Ambassador of the Margarita Mile, showcasing Dallas' unique place in the history of American mixology. Currently, Rodarte is the youngest restauranteur in Trinity Groves, an innovative restaurant incubator concept in West Dallas. After graduating from the Culinary Institute of America then working alongside chefs such as Dean Fearing, Rodarte opened Beto & Son in Trinity Groves with his father, Beto Rodarte, who served as a long-time chef for famed Dallas investor and restaurateur Phil Romano. Julian was named one of the 30 under 30 most innovative chefs in the nation by Zagat. "The frozen margarita means so much to our city. As a restaurant owner, I am excited to partner with VisitDallas to showcase and elevate this legacy for the millions of visitors our city welcomes every year," said Rodarte. "The invention of the frozen margarita machine solidifies Dallas' presence as a national food-and-beverage-forward destination. As a chef who specializes in Mexican cuisine, it's really something to be proud of." In 1971, a clever Dallas restaurateur, Mariano Martinez, invented the frozen margarita machine, and since then the way Dallas – and the rest of the country – drinks has never been the same. Paying homage to this invention, earlier this year, VisitDallas staked the claim that Dallas is the Official Home of the Frozen Margarita with the launch of the Margarita Mile, a collection of the city's best and most brazen margaritas, conveniently collected in a colorful app. "From the first time I saw Chef Julian make his liquid nitrogen margarita, I knew we needed to have him represent the Margarita Mile," said Frank Librio, Chief Marketing Officer of VisitDallas. "Dallas' margarita story began with innovation, and Chef Julian represents the next generation of that innovation and what makes Dallas a thriving food and beverage city." In addition to promoting the Margarita Mile locally, Rodarte will also go on the road to promote Dallas and the Margarita Mile as a fun activity and attraction to meeting planners at some of the largest and most important sales shows across the county. The Margarita Mile is not only your ticket to new and diverse flavors, it also celebrates Dallas' rich cultural heritage by driving visitors and locals alike to explore new and different neighborhoods. From the original – Mariano's in North Dallas – to Beto & Son in West Dallas, there are 16 stops on the Margarita Mile to keep visitors entertained and satisfied. The free Margarita Mile app is available on the Apple Store and Google Play. To learn more about VisitDallas' Margarita Mile, visit margaritamiledallas.com.